Malia told The Tab she did not know of Raza’s involvement in the group, despite following him on Twitter, where he includes his involvement on the first line of his biography. “As Presidents of Jewish Societies on campuses across the UK we have become extremely concerned by some of your past rhetoric. We feel that this is an issue that requires immediate answers considering your candidacy for NUS President in next week’s election. “We were recently made aware of an article you co-wrote in 2011 where you explained your experiences in Birmingham. You referred to the University of Birmingham as a “Zionist outpost” and referenced that it has the “largest [Jewish Society] in the country” when describing the challenges you were facing at the time. “There are roughly 8,500 Jewish students in the UK which is 0.12% of the seven million students that are represented by NUS. We are shocked that someone who is seeking to represent this organisation could possibly see a large Jewish student population as a challenge and not something to be welcomed. “Our question for you is clear: why do you see a large Jewish Society as a problem? “We fear that comments such as these will only hamper the amazing interfaith relations present on campuses across the country. Describing large Jewish societies as a challenge is the politics of division and not solidarity which should be the case. “We are also aware that these comments are not isolated. Just recently you explained at an event at SOAS that the government Prevent strategy is the result of a so called ‘Zionist lobby’. By peddling these conspiracy theories to student audiences we are concerned that you are creating an element of suspicion towards Jewish students on campus. “Lastly we are concerned by your relationship with Raza Nadim and the Muslim Public Affairs Committee (MPACUK). 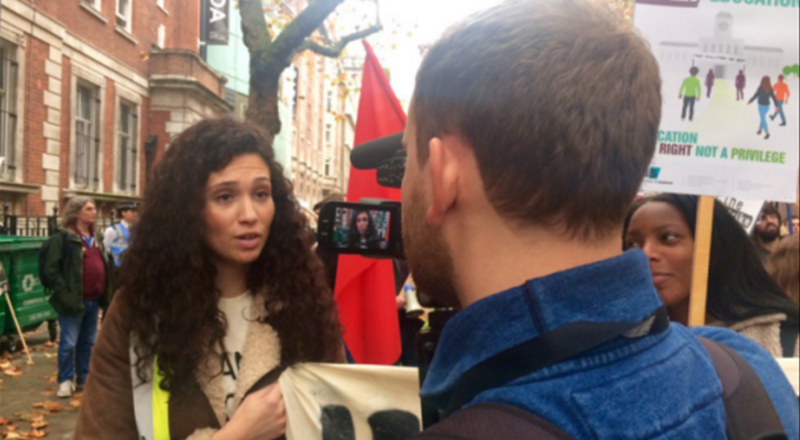 MPACUK have been no-platformed by NUS since 2004 after publishing material on its website promoting the idea of a worldwide Zionist conspiracy, including the reproduction of articles originally published on neo-Nazi and Holocaust Denial websites. 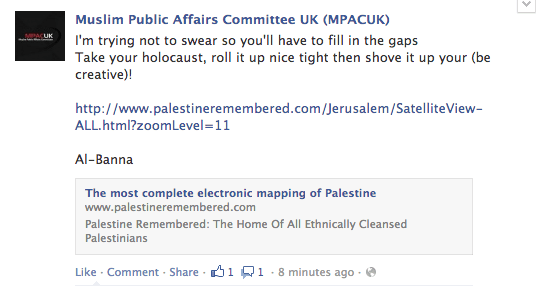 MPACUK even posted “Take your holocaust, roll it nice and tight and shove it up your (be creative)!” on their Facebook page in 2013. 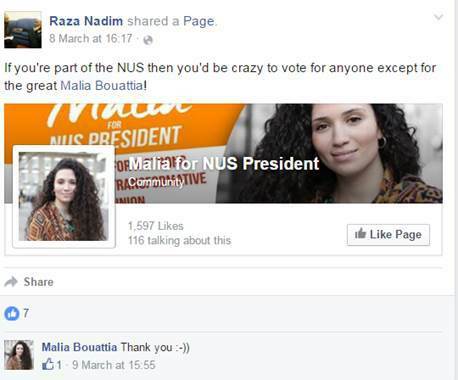 “We were also worried to see that MPACUK spokesperson, Raza Nadim, used his public Facebook profile (which is almost completely devoted to MPACUK) to endorse your bid to become President of NUS. We were hoping that this was something that you would distance yourself from but the opposite happened when you replied “Thank you :-))”. “As representatives of Jewish students across the UK, we call on you to clarify your relationship with MPACUK and its spokesperson Raza Nadim. If you are elected as NUS President, will you continue to interact with an organisation NUS has no-platformed due to antisemitism? “The answers to the questions raised in this letter are vital to our understanding of your approach to Jewish students and Jewish societies, and your commitment to creating cohesive campus communities if elected NUS President. We hope you will be able to shed some light on these issues in order to reassure our membership. Simon Zeffertt, the President of the Durham University Jewish Society, told The Tab: “I find it very troubling that somebody with close associations to MPACUK, who have been no platformed by NUS since 2004 and have a record of very anti-semitic rhetoric, is running for the position of NUS President.